Save Your Money by Being on the Lookout for This Lemon! Don’t Pay for Something You Don’t Need! 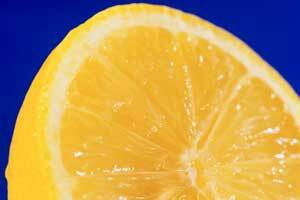 Recently I was going to try out a new recipe that called for 1 teaspoon of lemon juice. It’s been a long time since I bought lemon juice, but I’m pretty sure they still don’t sell it by the teaspoon. So this left me with two choices. The first was to get a whole lemon, squeeze out a teaspoon, and put the rest in crisper until it gets fuzzy enough to compost. The second was to get a bottle of lemon juice, use a teaspoon, and give the bottle a home in the door of the fridge (among all the ignored, and most likely expired, salad dressings I keep meaning to throw out). No matter what – I was going to end up buying something I didn’t need. While dining Aldesco the other day, I opened my mail and discovered another lemon I didn’t need: The 2013 Annual Minutes Form from Corporate Records Service. Many of you have asked me about this service. So I’d like to take this opportunity to let you know that buying this is a lot like my lemon – it’s paying for something you don’t need. If you have received this document in the mail (click the image to view a larger version), you can save your money. Instead of paying Corporate Records Service $125 simply use the forms in the third tab of your Company Binder and have your Annual Minutes completed for FREE! MYTH: Texas corporations must file their Annual Minutes with the government. TRUTH: It is a legal requirement for a Texas corporation to hold an annual meeting and document such meeting with written Annual Minutes. Annual Minutes for Texas* companies are NOT filed with the government. In fact, while Dodge Legal Group, PC highly recommends you conduct your Organizational Meeting annually, your company does not automatically dissolve if you fail to timely have your meeting. MYTH: Your Texas corporation needs a separate President, Director, and Secretary. TRUTH: Your Texas corporation can have the same human being hold all the same titles of President, Director and Secretary. Texas law does NOT require your Texas corporation to have a Vice President or Treasurer; it is optional to have these officers. 1. Let all of your shareholders and directors know the details about your meeting ahead of time. You can use the Notice of Meeting Form behind the third tab of your Company Binder. 2. Hold your Organizational Meeting and vote on issues important to your Company. If you are the only person in your Texas corporation, everything should be unanimous! 3. Fill in a Minutes Form located behind the third tab of your Company Binder so it reflects what you discussed in your Meeting. DONE! 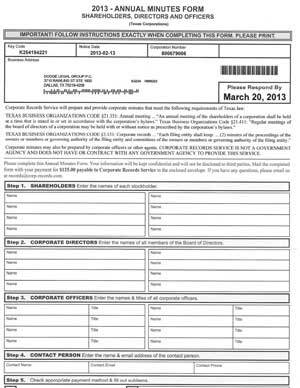 *If your company is registered in another state, your corporation may be required to file annual minutes. Contact us to learn how to Avoiding Corporate Shams for your specific state.